Remember back to the Saturday before last I did a Simple Saturday post on the gradual declutter of my craft room. I mentioned how obvious it was that the area needed more decluttering when viewed through the lens of my camera while I was taking the photos for the post. So this week I am going to give you an exercise which you can carry out one step at a time each day which involves looking at your space through the lens of a camera. There is no need to actually take any photos as the trouble spots will become obvious the minute you focus in on them with the camera. It helps to pretend that you are going to do what I did, that is, to take photos of the area and share them with the world. Once you think someone else is going to be scrutinising you belongs you can become quite a bit more ruthless about what should stay and what should go. So with that thought in mind let’s get started. Monday – Choose a room to look at through the lens. Today I want you to focus the view on all potential clutter areas of this room. Even if you think you have finished decluttering most sections of the room take a look at them anyway. A this point I just want you to consider whether each area you look at seems cluttered when viewed through the lens. Do not focus on individual items just on the area as a whole. Make notes of your feelings as you check out each section ~not cluttered, cluttered, way too cluttered, could do with a little tweaking…~ that sort of thing. Tuesday – Today I would like you to readdress the areas that you felt might need some decluttering. View them through the lens again and make notes of the things that you could do to help the situation. This might mean reshuffling to create a more balanced look, returning out of place items to their rightful place, or getting rid of some items altogether. Wednesday – Remove any items that you are willing to declutter and send them to the staging areas you use for donating, passing on to friends or family and selling. You may also have items that need throwing away of recycling so do that now also. Thursday – Return the out of place items to their rightful places throughout the house. Friday – Reshuffle any other items you feel will make the space look tidy and uncluttered. Saturday – Return to the room again and take another round of views through the camera lens and see what you think. Do any tweaking you feel is necessary. Sunday – Finally take one last look through the camera lens and if you are satisfied sit back and enjoy the area for a while and pat yourself on the back for a job well done. As I have mentioned before, I always stay about one month ahead with my decluttering in the event that I may go on vacation or something untoward might happen to prevent me from decluttering each day. That being said I end up seeing the images of objects over and over again as I upload my daily declutter item photo. 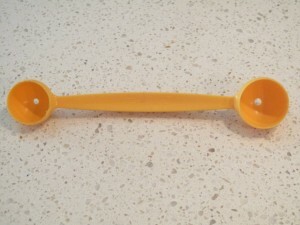 I say that because I swear I have used this melon baller photo before but a search of my blog says otherwise. If you remember that I have used it please let me know and I will declutter something else to take it’s place. The reason I am getting rid of the melon baller is that I never have reason to make melon balls. At one point I did use to quite often to core pears with but I can’t say I have done that for many years either. I find that utensil drawers in kitchens have enough useful gadgets to fill them up so I don’t need this item cluttering up much needed space. It will go, as usual to the thrift store. If I need to core any pears in the future I will just use a knife. As a person who can be fairly highly strung at times today I am feeling quite relaxed. Even though I have plenty to do and deadlines to meet I am not concerned and am happy to work at a sedate pace until everything is done. I am grateful to be feeling this way and when I stop to think about the situation I try to cement it in my mind for those times that I am not so easy going. The lesson is that if I can feel this way today I should be able to do it everyday and that is something to keep in mind the next time I find myself getting worked up about not having enough hours in the day. yes, love your words: “if I can feel this way today, I should be able to do it everyday”! I’m trying to become more of a minimalist myself, so thanks for encouraging posts like this! Sometimes it is easier said than done but so long as I can recall that attitude I will give myself every chance to follow the better path. Thank you for the warm welcome back although I am really not back properly until Wednesday. I am still away at the moment but am so looking forward to getting back to my own decluttered home, my own bed and my husband. We fixed my daughter wireless connection yesterday though so I have have better access to the Internet right now. I hope you have success with your daughter keeping her room decluttered. I know it can be a challenge. snickering at your decluttered item of the day … probably not because it soooo unnecessary (not planning to part with my ball-making-thingy though I never use it, because it is nice stainless steel and it is tiny and the one drawer of utensils I have is so decluttered by now that it is not taking away space of other items. So I am giving it a chance. There is always time to declutter it later.). It reminds me of the butter shaper (approximately 1960s) I just decluttered. It came from my grandmas house which we had to empty for her move (think: 1400 square feet house, build in the 1960s, clutter dating back even further …) and she thrust a couple of things upon me. I said yes to far too many things because of a couple of reasons. For once I did not want to hurt her feeling too much (I refused quite a lot but did not want to say no all the time), I actually wanted to have something from her but could not really decide on the spot because I was overwhelmed and everything had to go fast. And (worst thing): for everything I wanted she threw in some “if you take this you NEED this too” things. That butter shaper sure arouses my amusement if not my desire to own one although if I asked my mother-in-law I am sure she could find one in her house somewhere. i know where you are coming from though because I have just been home to my mums and she has started offering the things in her china cabinet to her daughters, daughters-in-law and granddaughters but I politely declined. She has some beautiful things but I have no need for them and they would just sit looking pretty like they have in her house for the last 50 plus years. I seems a shame to own beautiful china, crystal and sliver and it never gets used for the purpose for which it was intended. Uh oh. I’m offering some of the china from my grandmothers to my girls! Actually, they each want a couple of things so I’m going to pass them along. I always ask the girls first and if none of them are interested in the items then I feel OK about just getting rid of them (just a few items so far). I echo Loretta’s comments about welcoming you back and about how well Cindy kept up the blog. The mini missions seem like a good idea. I can’t participate this week because 1) we are painting our kitchen and 2) after the painting is done (or maybe before!) we are flying to OH to visit our daugther and grandson. But I’ll keep that idea in my brain for future reference. 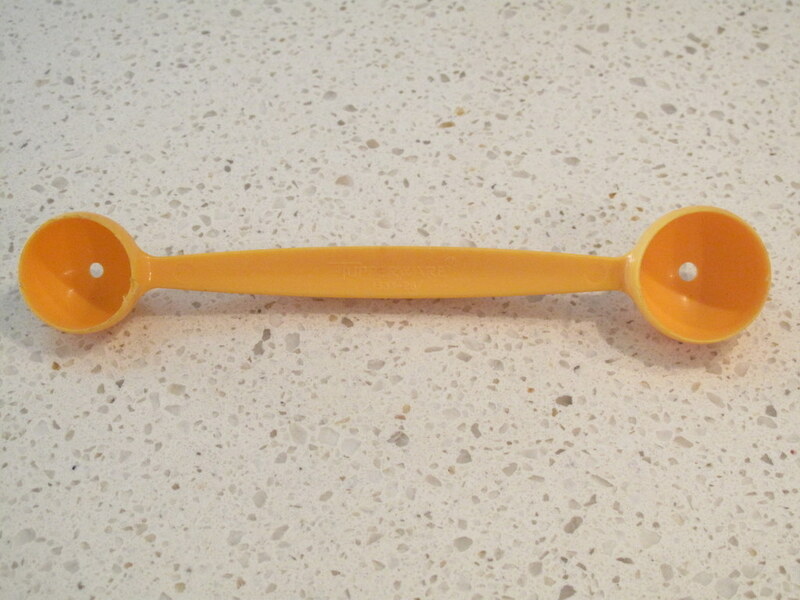 BTW, as I emptied the kitchen drawers in anticipation of the painting, I noticed only a few things I can pass along to the thrift store– I decluttered the kitchen a couple of months ago, but there’s always something like a melon baller stuck in a drawer. I am sure there will be come pieces of china that your girls would love and I am glad my mother offered me a choice of her pieces too. She had some beautiful water sets that were very tempting but they are more beautiful to look at than they are practical for me so I declined. Thank you for the welcome back and you are so right Cindy did a great job as always care-taking while I was away. It is nice to be able to take the time off completely and know my blog is in good hands. I hope you enjoy your trip to OH and you have fun with your grandson and daughter. I got to celebrate the fifth birthday of my great-nephew while I was away and that was kind of special because we don’t get to see them often. It must have been so easy to prepare your kitchen for painting since it wasn’t cluttered up with unnecessary stuff. That sure makes a big difference. I only have one now. It’s living on borrowed time, because, as much as my son loves melon balls, I hate making them. It is so time consuming! Thank you everyone for your nice comments, and I second (or third or fourth) a big WELCOME BACK COLLEEN. Thanks Cindy for the welcome and THANK YOU THANK YOU THANK YOU for always doing a great job looking after my blog when I am away. So many times now you have stepped up to the plate and gone into bat for me and I appreciate that more than you know. In fact so much so that just last night my hubby and I were starting to plan our US visit next year and are planning on going to Texas first. I hope you aren’t busy at the end of April.